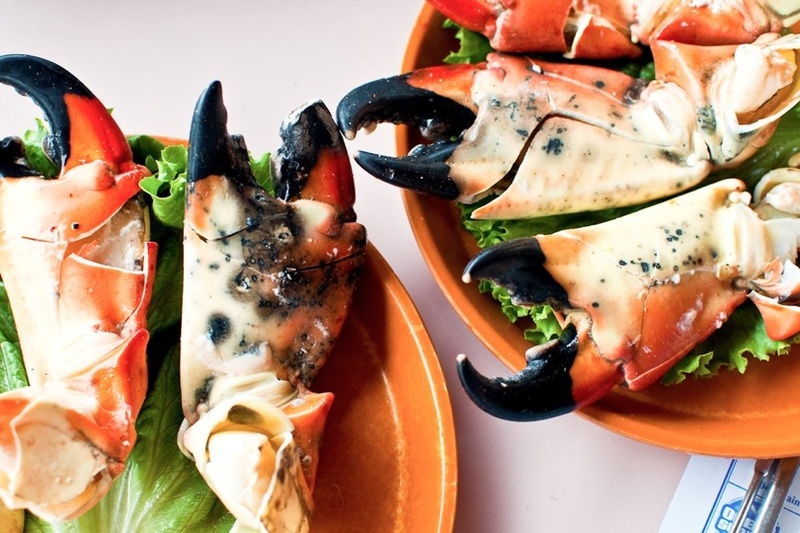 Gulf & Florida Stone Crab Claws - Find. Eat. Drink. Eat Stone Crabs - Find. Eat. Drink. Stone crabs have a sweet, meaty taste with a soft briny finish; they are sustainable; and they are in season from mid-October until mid-May. October 15 until May 15. They are crustaceans and are two different species: menippe adina and menippe mercenaria. Males crabs live to about 7 years and female crabs live to about 8 years. They are a renewable commercial fishing resource. Population levels are estimated to be high and no overfishing is occurring. It is nearly impossible to wipe out the stone crab population due to the fact that the crabs are not harmed and are able to regenerate their claws. All of the stone crab claws on the market come from wild fisheries; there is no aquaculture for stone crab claws. Crabs are caught in traps, Only one claw per animal is harvested - so they can continue to eat and defend themselves - then returned to the water alive to generate new claws, regenerating 4 to 5 claws in its natural lifetime. Each time the crab molts, a new claw grows larger. A “large” crab claw can weigh up to half a pound and “colossal” claws have reached a pound or more. In order to be fished, claws must be at least 2 3/4” in length and they cannot be taken from egg-bearing females. A good, low-fat source of protein, vitamin 6, selenium and magnesium. A 4 ounce raw portion is equal to 60 calories with zero grams total fat. Contrary to popular belief, stone crab claws are graded based on weight, not size. They are graded based on ounce weight. Once cracked, if the meat comes off the shell easily it’s fresh. If it sticks, they’ve been frozen. Stone crab claws have a 5 to 7 day shelf life. Once harvested, the raw claws are cooked on the boat or more commonly at dockside. In a restaurant, hot crab claws may mean that they are re-heated. But you can opt for either hot or cold. Eat with a simple squeeze of lemon on the meat, or dip in drawn butter, or in a mustard sauce. Place crabs in a towel or put a plastic bag over the claw (this will keep from splattering crab juice all over you and everywhere else). Using the back of a large spoon, hammer or mallet, strike the back or rounded side of the two knuckles and finally the claw with a quick snapping motion. The shell should be cracked gently, so the meat stays intact and is not pierced by the shell. Next, peel the shells from the claw and then separate the two knuckles from the main pincher. That’s where the tasty goodness is found. One note of caution, there is a hard center membrane inside the meat, so when biting into the meat be careful. 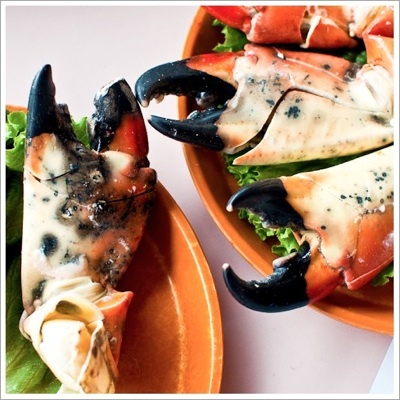 Keys Fisheries has been in business for over forty years and supplies Miami Beach’s famous Joe’s Stone Crab with its seafood. Gary Graves moved to the Florida Keys in 1967 and now owns 28 fishing boats, which specialize in lobster and stone crabs. He exports his seafood all over the world. The Bureau of Seafood and Aquaculture provides this list of purveyors who ship. Stone crab claws are often available, in season, at The Lobster Place in Chelsea Market.